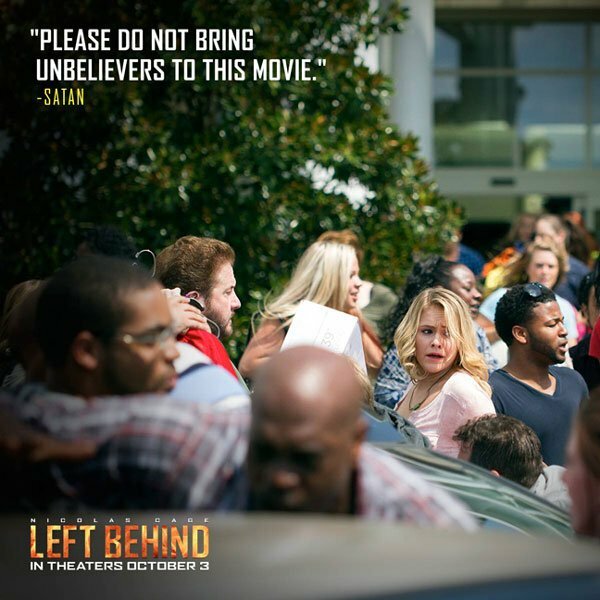 Congratulations To Satan For Getting Quoted In Left Behind's Marketing Materials! There are few things for an entertainment journalist more weirdly exciting than getting a quote on a movie's marketing materials. The notification email brings with it a rush of weird emotions including but not limited to happiness, pride, nervousness and uncomfort at the weird ethical gray area between critic and marketing aide. Many of us have felt it before, and now, we can add a new brother-in-arms: Satan. Created by God along with a whole bunch of angels, Satan originally lived in Heaven, but after a pretty serious falling out, he decided to move down to Hell with some of his buddies, whom he promptly renamed demons. Despite some issues with the weather, they all seem to get along fine and apparently have pretty easy access to critics’ screenings, where they can see things like Left Behind. Based off a popular series of Christian novels, Left Behind follows humanity in the immediate aftermath of the rapture. The adaptation stars Nicolas Cage as Rayford Steele and a host of other people you’ve heard of including One Tree Hill anchor Chad Michael Murray, former American Idol Jordin Sparks and most excitingly, Back To The Future’s Lea Thompson. I’m actually pretty pumped up, but unfortunately, I’m a bit concerned about something. While I appreciate that Left Behind used a pull quote from Satan, a critic who probably wasn’t easy to win over, the choice here lacks real context. Is he saying "Please Do Not Bring Unbelievers To This Movie" because they’ll see some frightening, realistic images of their future they won’t be able to handle? Or is this part of a larger quote in which The Devil, as he’s sometimes called, actually implores everyone to stay away? See what I mean? The whole review hasn’t gone live so we just don’t know. The film hits theaters on October 3rd. Whether you’re an unbeliever or not, the theater will sell you a ticket. It’s up to you to decide whether that’s a good idea. We all know where Satan stands.